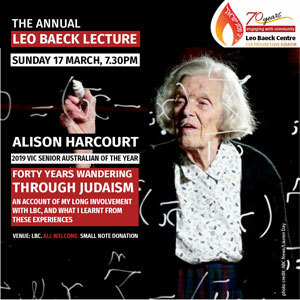 Speaker: Alison Harcourt, 2019 Vic Senior Australian of the Year. Topic: Forty Years Wandering Through Judaism: An account of my long involvement with LBC, and what I learnt from these experiences. All welcome! A small note donation would be appreciated.